My daughter has a 19 year old mare that looks really healthy and doesn’t even look 19 but seems to be having some issues. When she tries to canter the horse speeds up but doesn’t want to push into the canter or she will buck. If my daughter gets her into a canter she says it does not feel right at times and she suspects that maybe her arthritis is getting too bad. We didn’t start noticing the arthritis till a few months ago and she is now on joint supplements. My daughter is concerned and doesn’t want to force her into something that is going to hurt her and is wondering if maybe it is just attitude since she is very spunky. Do you have any advice? Arthritis that shows up as a reluctance to strike off at the canter or lope or canter roughly or buck during the transition usually stems from wear and tear of the hind limb (most notably the stifle and hock) and the loin. As you suggest, these behaviors can also be a result of a feisty or disobedient horse, but since you already know the mare has arthritis, in this case, you should focus on that. You don’t say whether the joint supplements are helping – and what kind you are using. As far as use – be sure the mare is thoroughly warmed up with walking and trotting before asking her to canter. Many horses warm out of their arthritis stiffness after 5-15 minutes of low level work. Focus also on transition work which is any upward or downward shifting of gears. The more proficient your daughter is at other transitions, the better the canter depart will be. Finally, be sure the mare is being ridden with enough collection so that she CAN canter rather than rush forward at the trot. Refer to 101 Arena Exercises to help develop the things I’ve mentioned both in the horse and the rider. Where do I begin? How do I judge my horse’s conformation. Develop a specific system for evaluating the horses you are considering. That way, you will have a better means of comparison. Be aware that wildly-colored horses and those with dramatic leg markings can cause visual distortions which could result in inaccurate conclusions. 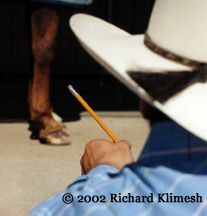 When you examine a horse, be sure it is standing on level ground with weight on all four feet. Begin by looking at a horse from the near side (the horse’s left side) in profile and assess overall balance by comparing the forehand to the hindquarters. When viewing the horse in profile, pay attention to the curvature and proportions of the topline. Let your eyes travel from poll to tail and down to the gaskin. Then observe the manner in which the limbs attach to the body. Evaluate hip and shoulder angles. Step to the front of the horse and evaluate the limbs and hooves for straightness and symmetry. Observe the depth and length of the muscles in the forearm and chest. Evaluate the head, eyes, nostrils, ears, and teeth. Be sure the teeth meet evenly with no undershot or overshot jaw. Then step to the off side (the horse’s right side) and confirm or modify your evaluation of the balance, topline, and limb angles. Move to the hindquarter and stand directly behind the tail. Evaluate the straightness and symmetry of the back, croup, point of hip and buttock and the limbs. Let your eyes run slowly from the poll to the tail as this is the best vantage point for evaluating back muscling and (provided the horse is standing square) left-to-right symmetry. You may need to elevate your position if you are evaluating a tall horse. The spring of rib is also best observed from the rear view. Now make another entire circle around the horse, this time stopping at each quadrant to look diagonally across the center of the horse. From your position at the rear of the horse, step to the left hind and look toward the right front. This angle will often reveal abnormalities in the limbs and hooves that were missed during the side, front, and rear examinations. Proceed to the left front and look back toward the right hind. Move to the right front and look toward the left hind. Complete the revolution at the right hind looking toward the left front. And finally, step to the near side and take in a view of the whole horse in profile once again. While you are looking at a horse, it helps if you get an overall sense of the correctness of each of the four functional sections: the head/neck, the forehand, the barrel, and the hindquarters. Head and neck The vital senses are located in the head so it should be correct and functional. The neck acts as a lever to help regulate the horse’s balance while moving. Therefore it should be long and flexible with a slight convex curve to its topline. Forehand The front limbs support approximately 65 percent of the horse’s body weight, so must be strong and sound. The majority of lameness is associated with the front limbs. Barrel The mid-section houses the vital organs, therefore, the horse must be adequate in the heart girth and have good spring to the ribs. The back should be well muscled and strong so the horse can carry the weight of the rider and the saddle. Hindquarters The rear hand is the source of power and propulsion. The hindquarter muscling should be appropriate for the type, breed, and use. The croup and points of the hip and buttock should be symmetric and the limbs should be straight and sound.